Our guide will show you the best time to book your short trips, summer holidays or weekends away! Find tips and secrets from the industry experts. According to our research, September is the cheapest month to book flights, so save on your Christmas holiday by booking early. Friday is the cheapest day to book flights. If you're thinking about going to France, book in November to save money on short-haul flights to Europe. However, if you're flying domestically, then save on flights by booking in April. If you fancy a long-haul flight out of Europe, November is the cheapest month for booking flights to Asia, America & more. When exactly is the best time to book your flight during the week? It turns out to be Friday! Try booking before the weekend to save the most on long and short-haul flights. 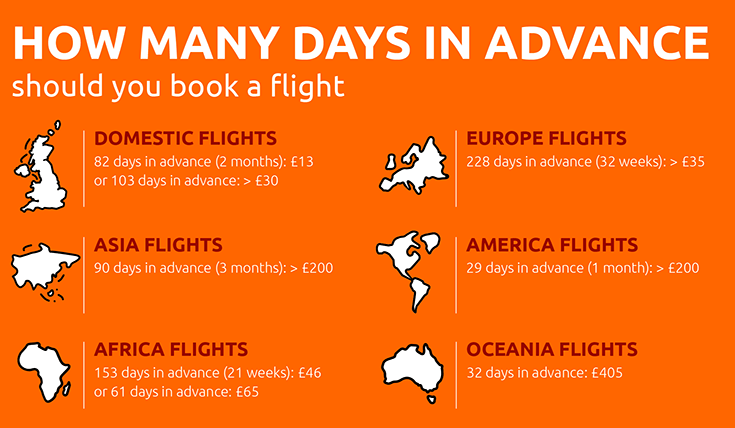 Generally the cheapest month to fly would be June, so book ahead to save the most for your summer holiday! Flights from the U.K in June average at 245 pounds, when compared to the most expensive month (December) that average reaches up to 330 pounds. Flying in June can mean savings of up to 100 pounds. Choosing your holiday route is an important decision and the price of that flight is determined by when and where you travel. A London to Bucharest trip in December costs £263, but that number plummets to £111 in January. Seasonality and weather is a factor, for example, Birmingham to Barcelona can reach £181 in August, but that falls to £96 in November during the off-season. Domestically seasonality is less of an influence, Edinburgh to London would be £83 over Easter (April) and that rises to £115 in January. Another popular route, Manchester to Paris, fluctuates from £134 in January to £174 in July. The capital city of Romania, this city is fast becoming one of the trendiest cities in Eastern Europe. An active night scene, affordable prices & some impressive historical landmarks such as the Palace of Parliament show that Bucharest has a lot to offer. This coastal city is the capital of Denmark, home to iconic sites such as the Tivoli Gardens, the Amalienborg Palace and exciting quarters spread across the city. Whether shopping around Strøget or exploring Frederiksstaden (the historic centre), Copenhagen has a lot to offer for travelers. Alicante sits on the coast of the Mediterranean, this port city offers everything from beaches to quaint bars in the old part of town (Barrio de la Santa Cruz). Visit the Castle of Saint Barbara, a medieval fortress that gives stunning views of the sea and the city. A beautiful island in the Mediterranean is the perfect destination for good weather over Easter. It offers more than beaches and lagoons, Malta hosts a number of temples, forts and castles that allows one to go back in time. It's capital Valletta is lively and atmospheric for families and lone tourists alike. In the heart of Europe, Prague is considered one of the most beautiful in the region. The Old Town, Charles Bridge, and the Prague Castle are a must for visiting the city. The city also boasts a great night scene, a variety of bars and restaurants cater to all. An ideal early destination, the hills of Edinburgh encompass the capital city of Scotland. Visit the New Town gardens or walk around the medieval Old Town, while the Castle is an amazing fortress with grants a view of the whole city. Weather permitting, it's a great place to visit. The capital of Norhern Ireland is a great destination in July. Home of the Titanic, Belfast has several museums and sites to visit such as the Botanic Gardens. A small city, it's easily visited over a couple of days, it has a great selection of food and bars to enjoy on a night out. The largest city in Spain is also one of it's most visited. The massive Retiro park is an excellent green space in the heart of the city, while museums like the Prado showcase some of Spain's greatest artists. Also home to football's elite Real Madrid, the city offers everything from tapas to shops. The capital of Portugal is considered to be one of Europe's trendy new cities. A young, international and vibrant community is putting Lisbon on the map. Cheap prices coupled with excellent sites such as the Belém Tower, Jerónimos Monastery or the Alfama neighbourhood are some of many reasons to visit Lisbon. The bridge between Europe and Asia marked by the Bosporus Strait, Istanbul is a unique Turkish city where cultures meet and mix in the same space. A great nightlife scene along with excellent eating options are a feature of Istanbul. Its main tourist attraction is the magnificient Hagia Sophia, a Byzantine-era basilica. Barcelona is one of Spain's most visited cities. The Catalan capital is home to the art of Gaudi, seen everywhere around the city. Famous sites include the Sagrada Familia Church and the lovely Park Güell. Food is highly rated in Barcelona, while the beaches surrounding the city are Mediterranean beauties. 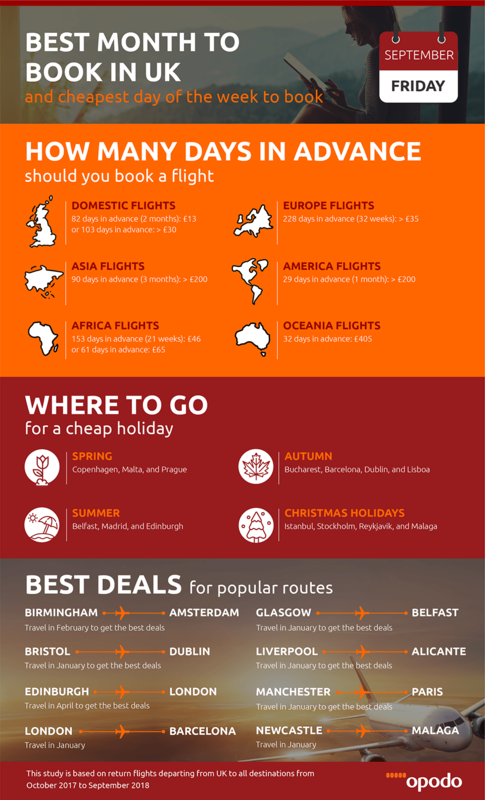 Where to travel over Christmas? To the Nordics of course, Stockholm is thriving over the holiday season. Gamla Stan is the old part of the city, is full of markets and Christmas spirit. Made up of fourteen islands, Stockholm is a great place to explore and discover different parts of the city. Booking flights in advance can save a lot of money, but exactly how far in advance? When is the best time to book those last-minute holidays? The general theory is that the more time in advance you book, the cheaper the flight will be; however, our data indicates otherwise. For example, when booking flights to America, you should book one month in advance for the cheapest flight to save over 130 pounds vs booking three months in advance. The best time for domestic flights to Bristol, Glasgow or London would be about eighty days in advance, for as little as twelve pounds. What about for outside the U.K? Find great beaches in Thailand and Malaysia for just 180 pounds. The same trip booked six months in advance would come up to almost double the prices. To Europe, enjoy the sights of Paris, Rome & Barcelona by booking six months in advance, which would be double the price if booked in half the time. And finally, see the wonders of Australia and New Zealand for as little as four hundred pounds if booked one month in advance. Try and be flexible during your dates and fly during the week. Flying out early or late at night can also offer cheaper options. Fly during off-peak times, avoid school holidays, long weekends and general holidays such as Easter and Christmas. Low cost airlines tend to use airports slightly outside of city centres, using these airports can often lead to a saving when booking a flight.